Andy's house is a 1880's semi and while a loft conversion was always on the cards it wasn't until Andy's fourth child came into the world that the need for an extra room started to change from a 'nice to have' to a 'must have'. Being an experienced DIY'er Andy decided that he was up to the challenge and decided to embark on his very own loft conversion. I said I would/could do it, so I will. 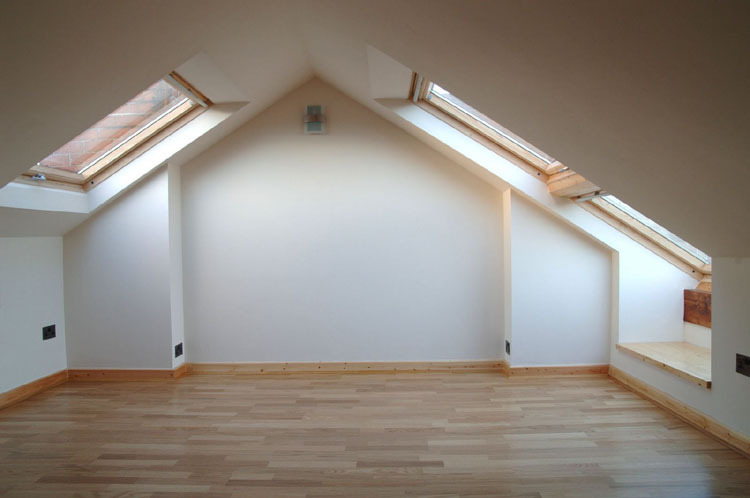 Andy decided to record the progress of his loft conversion in his blog Room Up Top, where appropriate on this page we will link to specific posts on Andy's blog. Andy's previous DIY projects include building a brick garage, moving bathrooms and installing central heating. As his day job involves sitting in front of a PC Andy finds that he enjoys the exercise and it's cheaper than going to the gym! 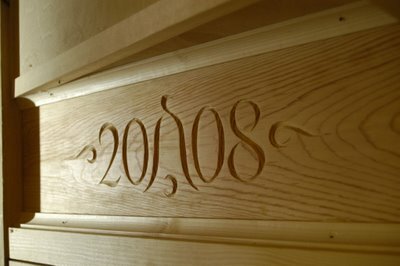 Andy obviously has a meticulous eye for detail and a steady hand, just look at this fantastic piece of wood carving that Andy completed, a very nice touch that adds a level of personalisation to the conversion. 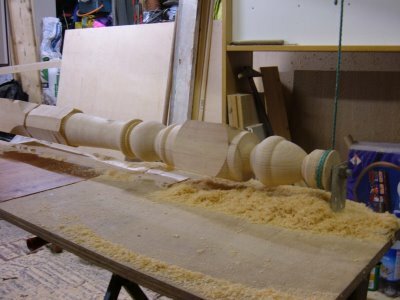 Andy's impressive wood working skills also extend to building a DIY staircase, most people would have contracted this piece of work out to local carpentry firm, but Andy is certainly up for a challenge and decided to build his own spiral staircase. 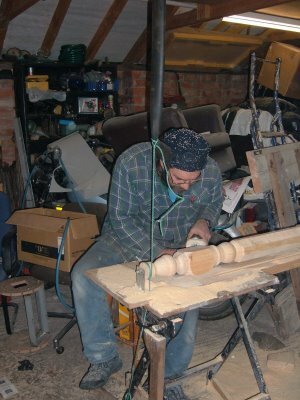 Andy even went as far as making a temporary 14 foot lathe to spin the newel post! With challenges come rewards, Andy felt a great sense of achievement building his conversion and told us "Every time I went up there I would imagine what it would be like when finished. As I was building the conversion, when the insulation went in the walls and roof you could see the room for the first time"
Around 18 months of hard work and giving up lots of spare time has resulted in an excellent result and low costs. The room will add value to the house, especially as it is completed to a high standard. In the meantime family life will that little bit easier now that they have extra space. Please take the time to head over to Andy's Blog to find out more about his conversion and maybe even leave a comment.